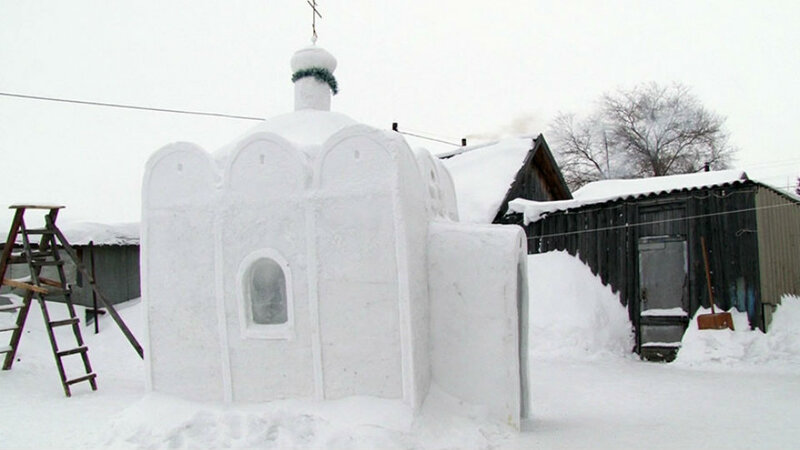 Alexander Batyokhtin, a 41-year-old man from the Siberian village of Sosnovka, spent six weeks shaping around 12 cubic meters of fresh snow into a three-meter high church, where his fellow villagers can now to say a prayer and light a candle. There is no real church in Sosnovka, or in any of the nearby villages, for that matter, and people who want to visit a place of worship have to drive for tens of kilometres to the city of Omsk. Last year, as soon as the first snowflakes started to fall, Alexander started drawing up the plans for his epic snow church, and after the first serious snow, he got to work. He first laid the foundation, then moved to the walls, before completing the twelve arches symbolising the 12 apostles, and an impressive church tower complete with a giant cross. He worked on it every day for six weeks, even in -30 degrees Celsius, and he managed to finish it in time for the holidays. The three-meter-high church is still around today, & is expected to last till early spring.